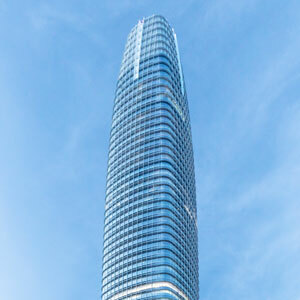 With environmental performance as a central theme to the project, the MEP strategy of Salesforce Tower includes advanced air distribution and blackwater recycling systems. The tri-path underfloor air distribution (UFAD) system works through a unique arrangement of fans, cooling coils, perimeter zone heating coils, individually modulated control dampers, speed drives, filter banks and multiple controls components, all specifically designed and arranged to serve both perimeter and interior zones from a single air handling unit, without the installation of mechanical equipment above the tenant ceiling or below the raised access floor. Each tri-path unit is constructed with three separate air paths. The top and middle air paths work together to serve the building’s perimeter zones, utilizing a modified variable air volume (VAV) multi-zone scheme that takes advantage of return air heat recovery in the top path, and outside air economizer free cooling in the middle path, allowing for simultaneously free heating and free cooling of different perimeter zones from the same air handling unit. The building also contains an innovative blackwater recycling system, the largest ever to be used in a commercial building in the US, saving 29.5 million liters of drinking water per year – which is particularly helpful in a drought-prone state like California. The system processes up to 151,416 liters and supplies up to 113,562 liters of recycled water every day, meeting almost 70 percent of the base building water demand.